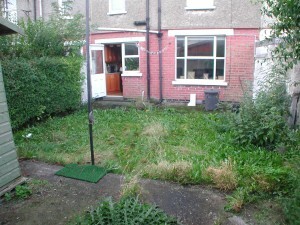 On the first visit to this new landscaping contract, the front and back gardens were in a bad state of disrepair. Access was a problem as the back garden could be only be reached by going through the the house. 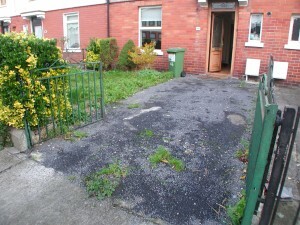 Clonliffe gardens is a very small estate with narrow roads and parking at a premium, so no room for a skip, all removal of rubbish would be by tipper trailer. After surveying the landscaping contract and discussing the clients requirements, we came up with the following brief. 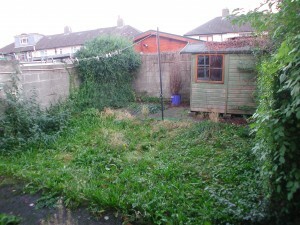 Our landscapers began by clearing the back garden of old shed, unwanted existing plants, old clothes line and rubbish. The existing Privet hedge was cut back hard to the boundary as it was shared with the neighbouring garden, this would clear room for the proposed pressure treated Scandinavian Spruce fencing. The front garden was cleared of the old concrete driveway, old path way and unwanted Euonymus hedge. All builders rubble and plant debris were carted to suitable recycling depots, we try with all our gardens to recycle as much waste as we can, and so reducing our Carbon footprint. 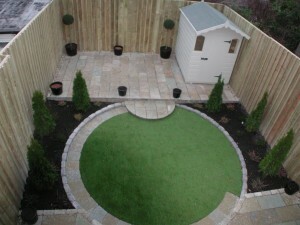 The back garden was the first to be landscaped. Heavy duty plastic was laid on floors in house to protect. 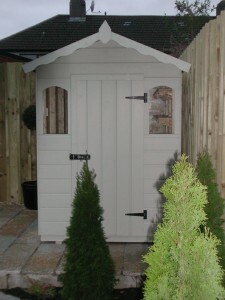 All materials were moved into back garden in one go to reduce disruption to client. 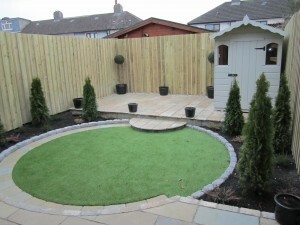 Our landscapers then constructed the new fence to surround the garden and create privacy. The material used was pressure treated Scandinavian spruce. The two raised patios were created by laying 600×300 Cota brown limestone slabs on a bed of 3:1 sand and cemet mix on existing concrete surfaces. By designing around and re-using existing structures in gardens a lot of time,work and money can be saved for use in other areas of the landscaping design. The planting beds were created using 200x100x100 Silver tumbled Chinese cobbles. Bordering the cobbles on the left side of the garden the semi-circuler path was installed using 300×300 Cota brown limestone slabs laid on 3:1 sand and cement mix. The lawn was created using Loco synthetic grass product laid on a 25mm bed of levelled plastering sand laid on top of a 75mm layer of compacted quarry screenings. The synthetic grass lawn was then fixed with nails to previously installed 2×1 pressure treated latts. The planting was very simple and comprised of Thuja smargards under planted with lime tolerant heathers. 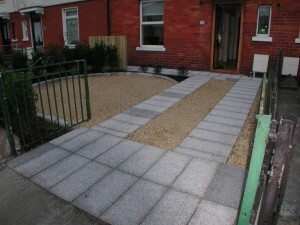 The front garden consisted of granite strips for car wheels which doubled up as paths to the front door. Ball lusk gravel made up the rest of the driveway. Planting beds were created using 200x100x100 silver tumbled Chinese granite cobbles. Planting consisted of a Portugese laurel hedge for privacy and mixed groups of shrubs including Myrtus luma ’Glanhime Gold’, Pittosporum ‘Tom Thumb and Santolina chamaecyparissus. The wheelie bin screen was constructed using pressure treated Scandinavian Spruce. 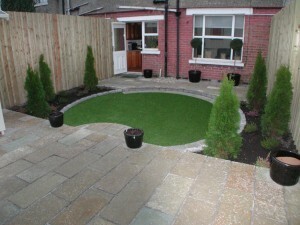 Previous: Landscaping Contract & Garden Design Loughlinstown, Dublin.